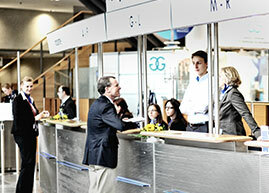 EUROKONGRESS places the same level of care and accuracy on every conference and event – whether it is the smallest or the largest. Logistical expertise, a well-rehearsed network of reliable service suppliers and a passion for our work, are the key factors for our success. This last week at Athens, we have enjoyed an absolutely outstanding and enormously successful ESPGHAN conference. I received extremely positive feedback from many members and other delegates who told me how much they enjoyed the meeting, which some said was the best ESPGHAN meeting ever. Personally I share the view that the congress was superbly organised. In addition, many exhibitors and sponsors have shared with me that they have been really pleased with the preparation and implementation of the congress and felt that their needs and wishes have very well been taken care of. In my role as past-president who was actively involved in preparing for the Athens meeting, I wish to personally express my sincere thanks and congratulations to the whole Eurokongress team for the dedicated and excellent work, and for the great success achieved! You pulled off an amazing organistation for our firms 50th anniversary and together we all made a great team to make this the most successful event in the firms history – that takes some beating, congratulations! For me it was a real privilege to work with you and the Eurokongress Team, you are great professionals and you contributed a lot to the success of the Congress! I do hope that we will have the chance to work together again! I wish you lot of luck and success to your future events! The meeting was really outstanding, both at the scientific level as in the organization. The food was excellent and abundant and the Bavarian night reminded me of old times in the October fest. Thank you indeed for the perfect organization as well as for your hospitality. I enjoyed every single minute attending the meeting and was pleased to chair this session. All participants, I have personally spoken to, appreciated the meeting and said that it belonged to the best they have ever attended.